For the mass rearing of rotifers as larval food the amictic way of reproduction (see 3.3.) should be favored. However, when the interest is in production of resting eggs for use as a storable off-the-shelf product mixis needs to be induced. These resting eggs, also called cysts, are relatively large (their volume is almost 60% of that of a normal adult female, Fig. 3.17. ), are ideal for storage and transport and can be used as inocula for mass cultures. 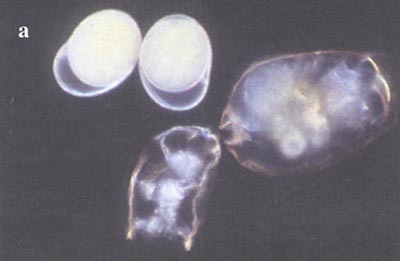 Mass production of rotifers for cyst production is performed in batch cultures in concrete tanks (Hagiwara et al., 1995; Dhert et al., 1995) or resting eggs are collected from sediments in earthen ponds. 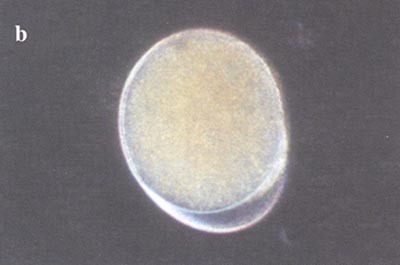 Resting egg production can be induced by limiting the food supply or changing the temperature and/or salinity. Resting eggs will sink and need to be harvested from the bottom. In case a lot of waste is trapped at the bottom it is advised to replace the water by brine so that resting eggs will float and can be collected from the water surface. If the sediment on the bottom is too important, to collect the resting eggs the water needs to be replaced by brine and the resting eggs will come to the surface from where they can be harvested. Dry resting eggs can be stored for more than one year. When placed in seawater, rotifer cysts hatch in about 24 hours at 25°C under light conditions. Newly-hatched rotifers undergo asexual reproduction. There are several advantages of using rotifer cysts to initiate mass cultures. The use of stock cultures is not required which considerably reduces labor cost and algal production costs. Moreover, the upscaling from stock culture to production unit can be considerably reduced by the use of larger numbers of cysts. The use of cysts is also highly recommended to prevent contamination. Cysts can easily be treated before hatching in order to ensure start cultures free from bacteria and ciliates. The resting eggs could be disinfected with heavy doses of antibiotics, so that the emerging rotifers are essentially bacteria free. The resting eggs can also resist short exposure to disinfectants such as NaOCl or glutaraldehyde.